It’s very hard to type this with my fists clenched in rage, but I will give it my best. I am trying to do something simple to update the look of my blog, and I am ready to put my fist through the computer screen. Was there some recent massive change to technology that I missed? Did the internet get harder? All of the sudden there are all these new words I have never seen before like “widget” and “favcon” and “SEO” (okay, that last one isn’t so much a word as it is an acronym). Why do I suddenly feel like I went from being pretty much being the authority on all things technology, to not knowing anything? Um, I am the person that had to set up the wireless router at my parent’s house. I have to reset it for them when there is an issue. I am literally our family’s IT person. Just this very morning one of my parents called me from the computer room to help them print from a PDF. I am kind of essential around here. But right now I am pulling my hair out trying to figure out how to make the About Me section appear to the right of this post, instead of up on the tool bar like it normally does. It is how the example blog is laid out, so I know it’s possible. It just apparently requires a degree in computer science and the team that runs NORAD. Even when I follow the very simple instructions it doesn’t work. And if there is not a super cute picture of me floating slightly to the right of your screen as you read this, with the header of “About Me” in an adorable font, assume that I am lying in bed, my head under the covers, my hand wrapped in bandages, and my lap top on the trash because the internet has beaten me. Technology one, Lauren zero. My grandfather, who never made it all the way through middle school, taught himself how to use a computer. He was very into genealogy and would do a lot of research down at City Hall, and then would come home and use a computer program (both on and offline) to sort and store all of it. In the mid-2000’s, he decided to level up his skills and switch from a PC to a Mac. I said, “Grandpop, are you sure you want to do that? As the family’s IT person I have to tell you that I don’t know anything about Mac’s. If you have a question I probably won’t be able to help you.” That man was self-taught in almost all aspects of his life. At his funeral I heard the charming (and also a little alarming) story about how he used to show up at job sites as a welder when he was first starting out and would claim to be experienced at whatever they were working on. He would work the job until they realized that he actually had no experience. Sometimes they would fire him on the spot and sometimes they would keep him on because he had picked up enough to do the job. He traveled around the country doing this until he had actually accumulated the experience that he had claimed when first starting out. I think he may the original “fake it until you make it” story. As I stated, he was self-taught. He navigated his PC very well and needed pretty minimal help from me. Mostly I had to get on the phone and deal with AOL when something changed with them or if he had a question. That’s right, I said AOL. I just dated myself. Now all the young people know why I don’t know what a widget is… she says as if young people still read blogs. They probably have some newfangled way of getting content cyber-blasted straight to their eye balls. And they probably don’t even call them eye balls anymore. They probably go by “cerebral windows” or some nonsense. Note to self, patent “cerebral windows”, it’s going to be huge someday. His transition from one operating system to another was pretty seamless. Unfortunately his health took a turn and he did not get to use the MAC as much as he had wished. If I remember correctly one of the first things he said to my mother after receiving his terminal diagnosis was, “But I just got that new computer.” Men, am I right? I, on the other hand, am having trouble even reading through the instructions for installing a plug in. I stopped reading the directions to start writing this because I could feel my blood pressure rising when I had to stop every other minute or so and Google a word that I am pretty sure a teenager made up (says the woman that makes up words all the time, I know, the irony is not lost on me). So, why don’t I know about any of this? Is it because I spend most of my time on the internet looking up what my symptoms mean and trying to figure out if I should be using “affect” or “effect” in a sentence (spoiler alert, I’m going to get frustrated with that too and just use the word “impact” because… why not). I used to laugh when you would see people on TV that would get overwhelmed with setting the clock on their VCR (dating myself again) and I would think, how can you not figure that out? What is wrong with you? Now I get it. I grew up on that technology so as the new stuff happened I was immersed in it. Technology today is so different. It’s games and apps and plug ins and codes and a million other words that I know what mean in one context but not another. I walked away from the computer and hid sheepishly in the bathroom for a while, flossing my teeth, because that was the relaxing break I needed (she said sarcastically). 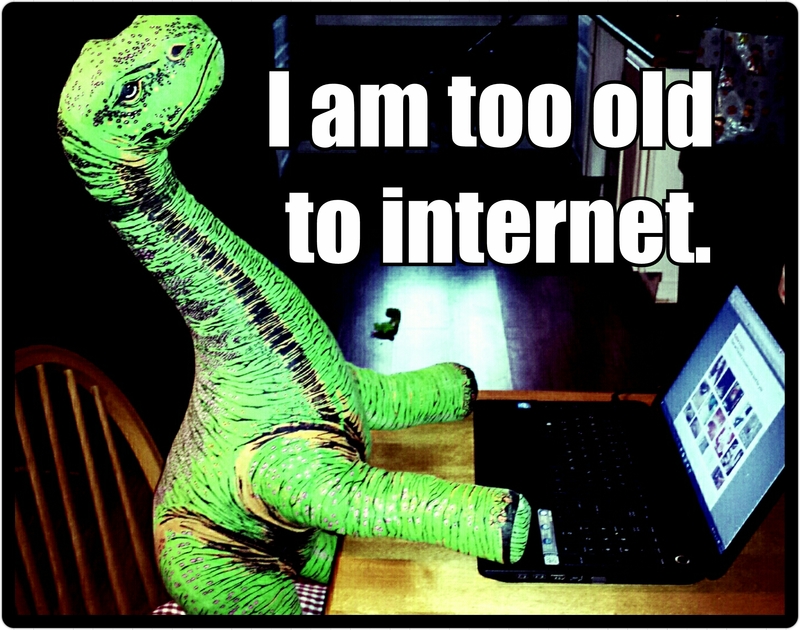 My husband came in to get ready for bed and I was telling him about how I was just too old to internet, and how somewhere along the line technology had gotten away from me. I was just going to delete my Facebook, throw away my kindle, and start a subscription for the Find a Word books my grandmother gets through the mail. He laughed at me (luckily for him, not too hard) and asked me if I wanted help. Apparently HE knows what widgets and favcons and all that other made up crap are. We had a quick talk about technology and how much I hate it and then both went to bed. While everyone else snored away happily, I laid there thinking again about my grandfather and how he would have plugged away at this problem until he figured it out. Or he would have called me up and invited me over under the pretense of having pizza, and then he would have casually asked me if I could take a look at something for him. I would have walked into the small room where his computer sat and there would be notebooks and notes scattered around filled with his neat block lettering. His impossibly sharp pencils lined up next to the key board. I would have known how to fix this problem for him. And if I didn’t know, I would have worked at it until I figured it out. I would not have punched his computer screen in a fit of rage. And I probably would have had the tolerance to read all the Google searches instead of reading just a snippet of the top search and then declaring all of it stupid and made up. I also would have been about ten years younger and a much more patient person than I am today. Or, perhaps closer to the truth, is that I am more patient when it comes to things for other people (especially those I love). I’d have taken the time so that I wouldn’t have let him down. Hopefully my husband shares that sentiment with me. Because, although my computer screen remains un-punched, my About Me still lingers up in the tool bar. Mocking me, it’s a glaring symbol of my failures to keep up with the times.